With the world facing a deep decarbonisation challenge, bold new technologies to dramatically reduce CO2 emissions from global energy supply are desperately needed. The potential of fusion as a deep decarbonisation solution is greater than ever, as scientists and engineers grab the attention of private investors and major organisations such as the Breakthrough Energy Coalition and the newly announced Breakthrough Energy Ventures. At Tokamak Energy, we are pursuing the ‘compact spherical’ tokamak route to fusion energy. This approach has been shown by both theoretical and experimental research to be a faster route than conventional large-scale tokamak devices, and is rapidly becoming acknowledged as the most promising route to achieving and deploying fusion power well before 2050. Our technology is based on high temperature superconducting (HTS) magnets, which allow for relatively low-power and small-size devices but with high performance and potentially widespread commercial deployment; we believe this technology will deliver fusion power into the grid by 2030. Demonstrating further progress with the spherical tokamak design is a primary focus. Our second reactor, the ST25 HTS, was the world’s first tokamak with exclusively HTS magnets and it demonstrated 29 hours of continuous plasma in 2015 – a world record. The ST40, our third reactor, is in its final stages of construction and is due to launch shortly as part three of our five-stage plan to putting fusion energy into the grid by 2030. The target of the ST40 is to produce plasma temperatures of 100 million degrees, seven times hotter than the centre of the Sun and the temperature required for achieving fusion in a compact spherical tokamak device. The aim for the ST40 in the near future is to reach 15,000,000°C, as hot as the centre of the sun. Following this, we will use the knowledge acquired from the ST40 to construct a tokamak device that will demonstrate first electricity from fusion by 2025. This tokamak will need to be considerably larger than the ST40, but still much smaller than the large-scale tokamak devices on the mainstream route to fusion, such as ITER. This will then form the basis of a first-of-its-kind power plant module that will deliver electricity into the grid by 2030. The goals on our route to achieving fusion power are bold and ambitious, but it is a challenge that must be tackled if we are to deliver the essential decarbonisation of our energy supply. This challenge will require many academic and industrial collaborations, dedicated and creative engineers and scientists, an excellent supply chain, and massive investment. This is all possible, and our approach is to break down the process into a series of engineering challenges, raising additional investment on reaching each new target. 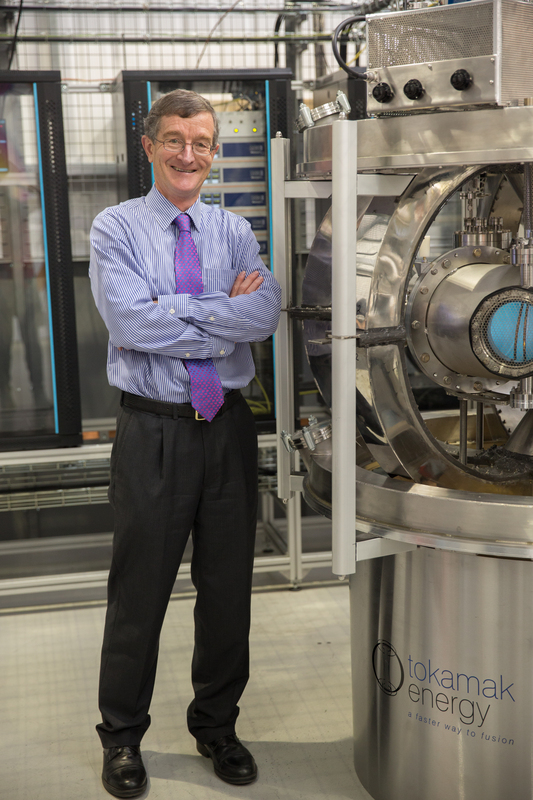 Our company has raised private investment of £20 million so far from Legal & General Capital, the Institution of Mechanical Engineers, Oxford Instruments and others, and has a valuable dialogue with leading laboratories with a shared vision, including the Plasma Science and Fusion Centre at MIT and Princeton Plasma Physics Laboratory. The future for fusion is promising. Private investors have a growing appetite for risk in scientific projects and are taking on challenges previously assumed to be in the hands of governments. This is allowing smaller, agile companies such as Tokamak Energy to take different approaches to fusion, which over preceding decades has become a large and slow-moving area of government funded research. We believe that dedication, collaboration and investment will enable fusion to be a viable solution to the world’s huge decarbonisation challenge.